Boeing has been accused of acting "spitefully" in a trade dispute with Bombardier which threatens hundreds of jobs in Belfast. It was also claimed it "walked away" from settlement talks and that the row damaged the "special relationship" between the UK and the US. Boeing representatives have been giving evidence to MPs at the Northern Ireland Affairs Select Committee. 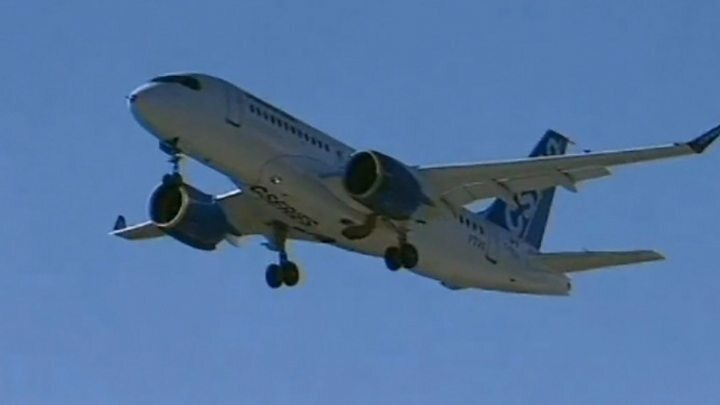 Bombardier's C-Series jet is facing huge US import tariffs due to the row. Heavy import taxes have been proposed by the he US Department of Commerce after a complaint by Boeing about illegal UK and Canadian state aid. It followed a C-Series order by US airline Delta. Democratic Unionist Party (DUP) MP Ian Paisley said such was Boeing's huge backlog of aircraft orders, it was complaining about "lost sales (to Bombardier) it could not actually fulfil". He added: "For the ordinary punter in the street it is not commercial, it is spiteful." Mr Paisley also claimed Boeing had "walked away" from settlement talks in June. Boeing's European president, Sir Michael Arthur, responded: "We would be very happy for this to be settled in accordance with the law. "We have been trying to get through this. We want a solution." Its communications director, Matthew Knowles, added: "It is Bombardier in the dock here for violating trade law." Independent Unionist MP, Lady Sylvia Hermon, said the dispute threatened jobs in Northern Ireland and its economy. 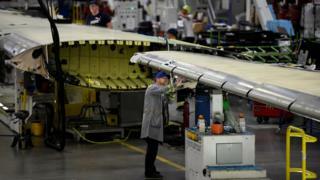 She felt Boeing was also taking advantage of President Donald Trump's 'America First' policy and that the row is damaging the "special relationship" between the UK and US. Sir Michael responded: "The press and others have made a lot of headlines about this. "We feel we have become a scapegoat for other wider issues. We are trying to keep this on a legal basis. "It is not for us to do politics." About 1,000 people are involved in making wings for the C-Series plane in Northern Ireland. During preliminary hearings in September, the US Department of Commerce imposed a 220% tariff on Bombardier, relating to subsidies it got from Canada and the UK. This was followed by an additional 80% tariff in October. Why is Bombardier and its C-Series important to NI?